As part of my journey to learn more about blockchain, I discovered I had a growing desire to visualize what was happening on the blockchain. I'm quite comfortable in the terminal; however, it's not always the most visually efficient way to interpret something. Not to mention it can be quite exciting to see things happening on a fancy UI! This is the backend service that runs alongside eth-netstats. This tool will be used to configure the node app. All the configuration and setup for monitoring a node on the Ethereum blockchain is done in this API. This is the frontend portion that provides a UI to visualize several technical components and information about the blockchain. You can view the public Ethereum blockchain using this dashboard here. In fact, you can even link your own Ethereum node to this tool and contribute to the other nodes providing updates about the public blockchain. Snapshot of the public Ethereum network stats. At this point, we're ready to download the tools that will be used to monitor the private network, or in other words, clone the repositories. Be sure to keep these repositories in an easily accessible place (i.e. NOT in one of the node directories). There are no specific installation instructions for this tool; however, make sure everything is up to date. I have run into a few problems getting things to work properly only to discover that a few quick updates did the trick. We'll configure the node app in the next section. "WS_SECRET": The secret used to connect the frontend and backend tools (i.e. eth-netstats and eth-net-intelligence-api). You choose any value to put here. Now that the node app has been configured, it can be started. The backend tool eth-net-intelligence-api uses a node production process manager called PM2. Most, if not all, of the commands used to interact with the backend node app will begin with pm2. Starting the node app, ‘app.json'. The backend is now running. Commands pm2 show <id>, pm2 logs, and pm2 list are helpful commands for debugging and general monitoring of your node apps with pm2. For more details use pm2 --help. $ geth --identity "node01" --rpc --rpcport "8000" --rpccorsdomain "*" --datadir "./node01" --port "30303" --nodiscover --rpcapi "db,eth,net,web3,personal,miner,admin" --networkid 1900 --nat "any"
After the geth instance has been started, refresh the Ethereum Network Status webpage. The node should now be listed on the dashboard. Now that everything is setup and the monitoring is running, the fun begins. First let's add in the rest of the private network that was created in the beginning. If you recall, there are a total of 5 nodes. With node01 still running, start node02 and node03. Attach these 2 nodes to node01 using the command admin.addPeer(<node01 enode address>). Refresh the dashboard, you should see the 2 peers appear for node01. Attaching ‘node01' and ‘node02' to ‘node01'. "name": To avoid confusion, give a name specific to this node (e.g. my_private_network_node04). RPC_PORT: Change to reflect the RPC port used by node04 or node05 (e.g. 8003). LISTENING_PORT: Change to reflect the listening port used by node04 or node05 (e.g. 30306). INSTANCE_NAME: Give a unique name specific to node04 or node05. Start the geth instance for node04 and node05 and refresh the dashboard. node04 and node05 now appear on the dashboard. Now the entire private network that was previously setup is being monitored on the dashboard! However, nothing is actually happening. Thats because none of the nodes are actually mining. Start a miner on node02. Notice that node02 is not shown mining despite being attached to node01. This is because the backend node app, app.json is connected to the ports for node01 NOT for node02. However, node01 is updating with the blocks that are being mined on node02. Additionally, you'll notice that node04 and node05 are NOT updating with the latest blocks. 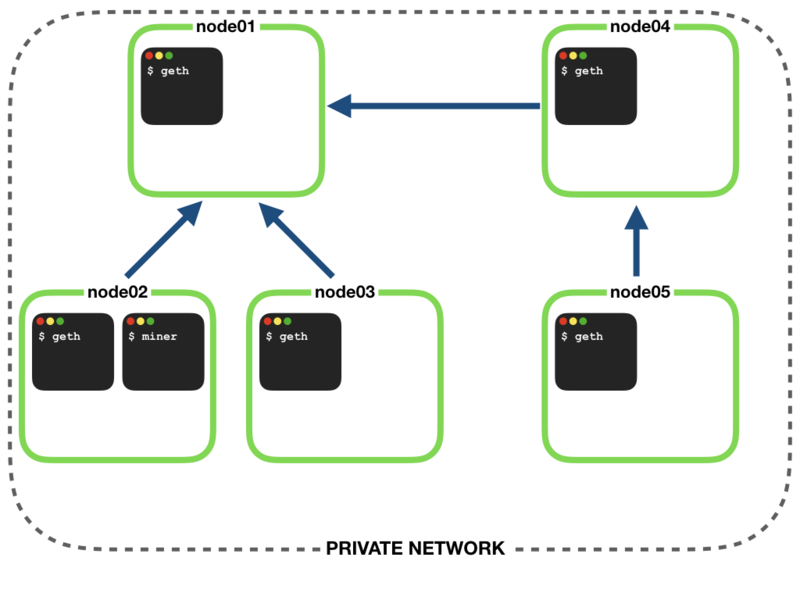 Recall that node02 and node03 were connected to node01 but, node04 and node05 were never connected and remain independent at this point. Diagram of the private network shows the node connections. After making these final node connections you'll notice that all the nodes will update to display the same last block. You may also observe that it takes node05 a bit longer to sync up with the rest of the network. This is because there are 3 degrees of separation between node05 and the mining node, node02. Monitoring the entire private network. After spending a fair amount of time experimenting with the blockchain I was compelled to find a way to better monitor the networks I was creating. Ethereum Network Stats provides a great way to gain a feel for how a Ethereum blockchain is operating. Can you add some more nodes to you network and monitor them on the dashboard? What happens if you create a node app for node02? Are you provided with any more information about mining activity that you weren't before?